Alanna , originally from the Boston area (USA), began playing the violin in 1994 at the age of four. In 2004, she began studying at the Walnut Hill School for the Performing Arts in Natick, Massachusettes with Professor Magdalena Richter and in 2008 was awarded a scholarship to study at the Royal Academy of Music in London, UK. 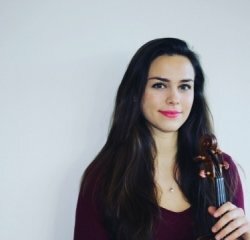 During her tenure at the Royal Academy of Music, Alanna studied with Professors Lydia Mordkovitch, and Remus Azoitei and served as concertmaster of the Royal Academy Symphony Orchestra, and the Symphony of the Encuentro de Musica y Academia de Santander. Alanna is the former second violinist of the Jubilee String Quartet based in London. The quartet, who were prize winners at the 2013 Trondheim International String Quartet Competition, are also recipients of the Park Lane Group Artists Award, the Hattori Foundation Award, Tillet Trust Award, and the Worship Company of Musicians Maisie Lewis Award which resulted in two Wigmore Hall performances and a Purcell Room performance at the Southbank Centre. They are also winners of the Val Tidone International Chamber Music Competition (2011), the Philharmonia Orchestra MMSF Charles Henderson Ensemble Award (2012), and the St Martin in the Fields Chamber Music Competition (2013) as well as Leverhulme Fellows at the Royal Academy of Music from 2012-13. Alanna is also involved in outreach work with the Karelia Duo. She and her cellist, Hermione Jones, do a variety of projects together and work mainly through LIVE MUSIC NOW, the leading musician development and outreach organization in the UK. In 2014, Alanna completed her Master’s of Music degree with distinction at the Royal College of Music in London as a Leverhulme Scholar under Professor Jan Repko. she is curently Sub-Principal 2nd Violin in the Royal Northern Sinfonia. I am eager to teach anyone who is eager to learn. All I ask is that you do your practice and try your best!